I went to the charity shops today, not really expecting to find anything, but was very pleased with what I got!! I went out with just under £20 and came back with a 70s navy floral maxi skirt by C&A (now no longer in the UK), an 80s chiffon crepe floral sundress, an 80s leopard print dress complete with shoulder pads and smiley face buttons, a fluoro pink cheesecloth short sleeve blouse (to wear with my Chloe jeans) and a modern floral maxi dress, to replace the one I had to give away as it no longer fitted! Oh, and 15p in my purse!! Love the dress, its fab! Also, loved all the things you got at the the car boot sales. Those handbags were a bargain. Got a red dress thrifthing today, ands its pretty cool. Yay! Hi Siljes-thanks so much!! I think we are 'thrift twins'-it must be the Gemini genes- ha ha!! Hi little wildcat! The pattern of the dress is amazing and I love the shape of the dress. Hi Charlotte-thanks so much-I was lucky that it does fit like a glove! Hi ash1314-I love leopard, too-I've also got a faux fur vintage leopard coat for winter! 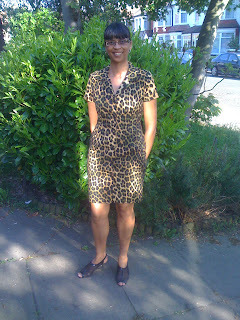 I'm loving the leopard, it can be hard to pull off for us mere mortals but you're absolutely rockin' it!!! Thanks, so much, emmapeelpants!! It is nice (and rare) to go thrifting and find quite a few items all in one go-it's a buzz! wow you wear an animal print so well! amazing and impressive! Thanks so much Jen-I'm lucky the dress fits like a glove!